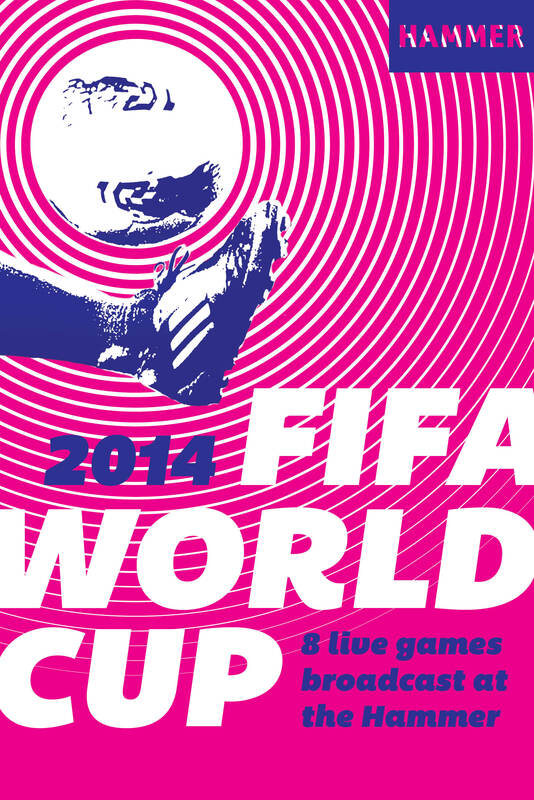 Hammer’s free FIFA World Cup screenings are scheduled to take place in 2 locations around the museum. * Each venue offers a unique experience. In the Annex, experience a large, 12’ x 6’ high definition projection and robust sound system in a black box theater space. Food and drinks are welcome in the Annex, and families with youngsters will feel right at home in the relaxed “come and go as you please” atmosphere. For full immersion and ultimate reverence, visitors will love watching the high definition action in our darkened, state-of-the-art Billy Wilder Theater with a 35 foot wide screen! Food and drinks are not allowed inside the theater. The regular weekend menu, as well as a selection of World Cup-inspired specials, can be purchased at AMMO. Don’t forget, admission to Hammer’s galleries is also free for everyone. Check out our museum-wide exhibition of 35 local artists and collectives, Made in L.A. 2014. *Venues subject to change. Please ask any of our Visitor Experience Representatives to direct you to the available venue of your choice. View photos from the screenings here. Parking is available under the museum for a flat fee of $3.